Beaches in Cyprus come in all shapes and sizes. If you are looking for sandy beaches then you may have to look real hard. Or we can give you all the details here before you decide to head out. This country is truly beautiful. Some of the amazing beaches here are what really add to the true beauty of Cyprus. Its coast hosts many of the world’s finest sandy beach and offering that light blue ocean that people only dream of after seeing on the TV or adverts. There is no reason why you should only dream when it’s all there to experience, so let’s take a look what Cyprus has to offer. Where ever you are, you will be within close range of some of the greatest beaches you will ever find. There are beaches located down most of Cyprus’ coast, stretching from Paphos all the way to the party central Ayai Napa. Below is some of the best beaches available with some information about each of them. Nissi Beach is one of the many absolutely stunning beaches located in Ayai Napa. This beach is exactly what you see on TV, it has a beautiful sandy coast leading to a beautiful light crystal blue sea and is perfect if you’re looking for an immaculate view or walk along the 500 metre beach. It hosts a range of rented accomadation that is available all year round, and also has resort style facilities available. There are often sports played around here so you can really join in and enjoy your holiday on this fun filled beach. 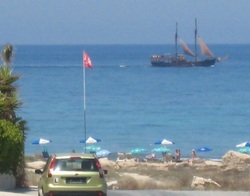 Coral Bay is located in Paphos, and although it can get very busy this should not but you off this beach. It’s wide open area is perfectly for those looking to spend as much time sunbathing as possible, at night the sunset is simply to die for. The high amount of activity and location is really what brings so much attention to this beach, and it is definitely one to check out. Konnos Bay is located in Protaras, and can definitely compete with being one the best beaches in Cyprus, if not the most beautiful in the world. This beach is relatively small compared to some of the others; however it’s beautiful, clean, blue waters are absolutely amazing and you could never be disappointed with what it has to offer. The only real downside to Konnos bay is during peak times of the year is often extremely packed; however this should never put you off. Pissouri Beach is of the village of Pissouri, it tends to be one of the quieter beaches but has its busy moments. It is a stunning longer and sandy beach with those amazing waters that Cyprus never tends to be short of. There are a wide variety of activities available at this beach including water sports and beach sports. It is great as both a family beach or a relaxation beach and due to the calm waters you can swim out quite far before you are asked to turn back. There are only a few of the many beaches Cyprus has to offer. The only real way to experience them all is to visit as soon as you can, so you can really benefit from this beautiful scenery and the amazing experience that is Cyprus. Fig Tree Bay is located in Protaras and is one of the most popular beaches in Cyprus and Europe. It's sandy beaches and calm waters are in an excelent location for swimmers and tourists that can enjoy the many activities available.